As a busy working mom, I have to streamline and automate my homeschool planning and record-keeping. I just don’t have the extra time to be writing out lesson plans in a cute planner every morning. I love a homeschool planner that helps me plan and save time! Homeschool Planet is the best homeschool planner ever! Disclosure: I received Homeschool Planet for free and was compensated for my time. However, all opinions stated here are my own, and I was not required to post a positive review. When you are a working mom, homeschooling and homeschool planning works a little differently than it did before. When Beezus was young, she and I sat down every day and worked through her school work together each day. I was very involved in her school on a daily basis, so there wasn’t much need for a daily lesson plan. I pretty much knew where we were going and was able to be flexible in the daily plans. But as my kids have gotten older and I have had to work full-time, I had to change my systems and expectations. I couldn’t really be with them every minute of the day to make sure they got everything done. So I have found other ways to make my kids are accountable, and to make sure that they are keeping up with their studies as they should. One of the best things I did, when I went to work full-time outside the home, was to use an online homeschool planner to help keep them on-track and accountable. And then at the end of the week, we get together for an accountability meeting to look over the work they did during the week. I have tried several online planners, but I always come back to my very favorite. 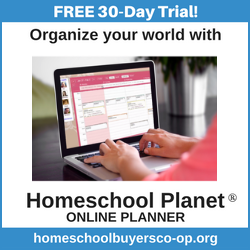 If you ask me, Homeschool Planet from Homeschool Buyer’s Co-op is the best homeschool planner anywhere! Whether you work or not, Homeschool Planet will make your life easier, I promise. It saves me so much time and headache and helps to keep me on track in a crazy busy world. Homeschool Planet has so many features that I haven’t even used them all. There is so much to love about this program, that I could be here all day gushing about it. Every time the question comes up in homeschool mom groups, I am the first to pipe up and extol the virtues of Homeschool Planet. I am sure you can read the official word on their website, so I will tell you my favorite features. First, I love how easy it is to schedule a whole year at one time. You set up your school year with your desired days off, and it automatically schedules around those days. And if you miss a day, or your kid is sick, it’s so easy to reschedule! Just choose the Rescheduling Helper and it does everything for you! Like magic, almost! You can also use this tool if your child gets behind in only one subject, and some of the assignments are overdue. Oh my goodness, that saves so much time! Now, I am not big on grading and giving grades, but as Beezus has moved into high school (eek!) I am feeling the need to keep really good records. And Homeschool Planet makes that easy too. Because most of her classes are online, she gets a grade on each assignment. She enters the grade into Homeschool Planet as she checks off the assignment and voila! Instant Transcript! Takes all of the worry out of High School record-keeping! Homeschool Planet has lots of other great features like pre-planned Lesson Plans for many popular curriculums, time tracking, reports galore, and more. You can even use it on your phone or tablet with the mobile version. Try it out and I promise you will be glad you did! Try the best Homeschool Planner for Free! Homeschool Planet offers a 30-day free trial so that you can try it out without any kind of commitment! So run, and sign up for free before you start on your lesson planning for the next school year! I promise you won’t regret it! WOW, that sounds like something that I definitely need. I found this year that with working, homeschool, health issues and just life, I was always behind the curve with no way to catch up. So I’m starting early this year to prep and this might be one of the pieces that I need to add into the mix. I loved all the ways the Planner seems flexible and easy to use – I didn’t want something that took forever to help me organize! Thanks! Yes, I really love it! It makes it so easy to plan the whole year in just a little while!